I was suppose to go on a trip to Gangotri and Yamnotri to himalayas but due to certain unforeseen circumstances I was forced to cancel my trip. Quiet naturally I was very upset and frustrated. Secondly the heat in Mumbai was showing no sign of dying down hence going on trek was becoming a very difficult preposition. If you are an Indian and a Hindu you would very well be aware that on the occasion of pooja (prayer) or starting any new venture it is always the Lord Ganesha that we invoke.I therefore decided that this weekend wandering would be somewhere close by hence I decided to make a visit to Siddhivinayak Mahaganpati Titwala Temple. Sunday mornings or Saturday nights are always full of excitement because I am always on a verge of new adventure. I left my house at 10.am with my wife,daughter and my father. As we live in Andheri so I took JVL Road via Seepz , passing through Hiranandani Powai township on my right and lovely Powai Lake on my left side of the road taking the Gandhi chowk I reached Eastern express highway. and moved toward the Thane side.Being Sunday I was lucky that there was no traffic. To reach to Titwala temple one must drive straight till Kalyan Phata( You will encounter 2 toll naka enroute one at thane and the other around 3 kms before the Kalyan Phata.Toll at thane was Rs 30/- one way and the second toll naka I paid 43.50/-return or pay 29 Rs one way). Upon reaching the Kalyan Phata I took a right turn and after 5 to 7 minutes I came across another toll naka(toll charges 37.50 return and single way Rs 25) From here onwards one should keep driving as the road moves and keep asking for directions to be sure as most of the people know the way to Titwala temple. Moving through the Kalyan city,then Shahad one can see Birla college on your left, keep moving on till you come to see a sign board pointing left to Titwala. Take a left turn and it is a kind of single road so no chance of losing the way.This whole drive was about 60 Kms from Andheri East station and took nearly 1.45hrs to reach here at Titwala Temple. One look at temple and I was surprised to see a sea of change that has occurred here over the years today when we see the Temple it has indeed come a long way since my first visit a decade back. I still very clearly remember that there was this ancient temple with just few vendors outside selling flowers.Few auto riksha and Tongas. but today as the temple stands with all its glory talks a lot about the popularity of this place. Shopping arcade with small shops on both the sides selling flowers,garlands. We parked our car in the parking lot (yes today they have a parking lot here) and moved on towards the temple between the parking lot and the Temple today a shopping arcade has been constructed with small shops on both the sides selling flowers,garlands, coconut,prasad thali and many things. Joining the parking lot one can have a look at lovely lake ( I was given to understand that this Temple area spreads across 12 acres) in earlier days this lake was not so prominent but today it has been beautified very well , with boating facility in the lake(one can see couple,families enjoying their boat ride. We also bought Prasad Thali and moved on. Before entering the temple please let me brush up few historical facts about this temple. 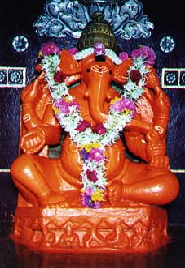 It is believed that this Holy Titwala Ganesh Temple is a very ancient dating back to 11th century and as per the legend by propitiating Ganesh Idol, Consecrated by Sage Kanva, Devi Shakuntala & King Dushyant came together after a long period of disagreement and it was here that Devi Shakuntala & King Dushyant ultimately got married ( I think perhaps due to this reason the folklore gathered wind that those who worship and offer prayers to Lord Ganesh here their Martial discords get cured and those who want to get married get their desired Mate). Upon speaking to a local person I was informed that the remains of the temple were discovered during the reign of Peshwa Madhavrao and it was he who was instrumental in rebuilding the Temple at its present spot. However with the passage of time the reign of Peshwas went into a decline and consequently the temple too got ignored and was once more got converted into ruins.It was only after 1966 onwards the Temple was reconstructed at the same location. I think enough of history let us now have a look at the present day Temple. In earlier days the entrance used to be from right side of this temple. During earlier days the entry to the temple was straight from the front.But now the devotees not only from Mumbai and nearby places but also from far places come here to worship so the Temple gets very crowded especially if its tuesday,Chaturthi or Jayantis to over come this chaotic situation the Temple management has built a Steel barricades which look like a maze but at the end you reach your destination. I had taken few pictures of this barricades (Actually the Temple authorities are very strict about taking photographs, but cant help it for my readers benefit i managed to sneak few pictures). This entry to the temple starts from the left side of the temple where one is ushered into this big hall consisting of unending barricades. This queue takes you straight to the Holy Sanctum where the Idol of Lord Ganesh is. I have never understood why devotee love to push each other so much while taking Darshan. ( Arre boss Bhagwan kahi jane wale nahi hai...). After taking the darshan I moved from the right side and into the hall on the ground floor.The temple is actually divided into two floors.The ground floor is marble fitted where the devotee can sit and then there is a loft kind of floor above this which is made of wood , On the first floor there is overlooking window from where the devotee can observe the Ganpati Idol on the ground floor.One can also have pradikshana on the first floor.while doing the pradakshina on the top one can a bird view of the lake behind the Temple. The walls of the temple are covered with different photos most of which I could not comprehend.At some places the prayers are painted, As far as the ground floor is concerned just before the Ganesh Idol section there is an enclosure for the Royal Mice which was gold plated this time. ( Hindus believe that when you whisper your desire the same is communicated to Lord Ganesh and that wish gets fulfilled)Just next to the left side of this hall is another hall which contains numerous mandaps where the satyanarayan pooja is done. The pooja can be conducted by paying small donation at the temple. One need not do an advance booking for the pooja. It can be arranged then and there immediately, the only limiting factor is timing (between 7.00am to 11.00pm) On the right hand side of the the main entrance (now exit) is the sacred Shivling. We had our darshan and came out of the temple. Just in front of the exit of temple on the left side there is books/souvenir shop, in the front there is a well and on the right side water cooler. The whole complex is well maintained.The devotees sit here and rest.Next to the Satyanayan pooja hall on the left side of that there is a big empty hall where the pilgrims have lunch and rest. From the Temple we moved towards the back of the temple to have a closer look of the lake and the garden adjoining it. I noticed that a long passage with seating arrangement is there where you see varied type of crowd ranging from couples,families having lunch,few people taking nap, small kids running around. This was our final look around of the temple complex. From here we also went to visit Vithoba-Rukmini temple which is very near to this temple. Vithoba-Rukmini temple is under going major reconstuction so it is quite possible that the next time you go you will be waiting for new surprise. There is a big hall and a Holy sanctum which house the Idol.There is also a veiwing gallery on the first floor. There is a rod coming out from this sanctum. It is said that sounds of Bhajans going on in the Temple of Pandharpur can be heard from this tube. Indeed I could also listen to these bhajans . This was my last sojourn at Titwala and I prepared for my journey back home. Before closing my blog I want to inform my readers that there are many small hotels and lodges so accommodation is not a problem. Monsoon is one of the best time to come here because the greenery en route is beautiful and eye pleasing. Temple Close for 13 to 14 hours and 14 to 14:30 hours for Arthi Every day. Temple remains open at 4 pm to 23 hours For sankashti, chaturthi. On the central line towards Kasara (Fast / Slow is ok), get down at Titwala Station. The Titwala temple is at a distance of about 2.5 km and can be reached either by Tanga (for Rs.20 if 6 person either Rs 30 Individual, Return Rs.25 ) or by Auto (for Rs. 10, Return Rs 8) in around 5 to 10 mins. Wonderful....thanx for your details.it really helped..
Really a very helpful info. Have u visited Durshet Forests near Pali. I need info about the place. Hello sir... the mountain range you are asking is the divide between Kalwa and Mumbra. on the other side of the Mountain, you have Mumbradevi temple. awesome view from the temple. at the half way towards the temple, if you turn right from Hanuman mandir, the route takes you towards a nice spot famous for Rock climbing practice. 2. The pipe through which they say... you can hear the bhajans... is in fact the outlet for water which flows after the daily abhishek and snaan of the idols. i too was fooled once. thanks for the information.it's really helpful to us. Thanks Aashish, your page is useful for all the people who are planning to visit Titwala (like me) keep on doing good work. God bless you. Thanks for this useful piece of information. One day taj mahal tour from delhi package is fully based on memorable tour, It cover all over places in delhi and agra. I stay at Andrei west. I had been titwala ganpati mandir last year I on 26 th January. Missed this year . Hope 26 Jan 2017. Get great deals on Indian vacations and tour packages for your family – Explore the many attractions of India through Discover Amazing India Tour Packages. You will be spoilt for choice when it comes to sightseeing during your India trip. Enjoy the romantic moments at Taj mahal on your honeymoon, soak in the history of North India, marvel at the architectural wonder of the of The Taj Mahal, or just Explore the Amazing Heritage sites. Book your India trip-Golden Triangle Tours India today. Thanks for sharing info. Keep up the good work...We hope you will visit our blog often as we discuss topics of interest to you Jaipur Tour Packages.